Members of a resistance unit in Eslamshahr, southwest of Tehran, the country’s capital, put up posters of Maryam Rajavi, President of the Iranian opposition coalition National Council of Resistance of Iran (NCRI). In Khuzestan Province, southwest Iran, a resistance unit member set fire to a poster of regime founder Ruhollah Khomeini. Members of resistance units in Jahrom, southern Iran, set fire to a Khomeini poster while marking the upcoming annual Fire Festival, celebrated on the last Tuesday night of the Iranian calendar year. This year these festivities will be held by the Iranian people on March 19 and the mullahs’ regime have always considered this to be a threat to their rule as Iranians across the country turn these celebrations into anti-regime protests. This resistance unit was chanting, “Death to Khamenei – Hail to Rajavi,” referring to Maryam Rajavi and Iranian Resistance leader Massoud Rajavi. Members of resistance units in Yasuj, southern Iran, took to graffiti and wrote “Hail to Rajavi” in various parts of the country. In Shiraz, south-central Iran, members of resistance units distributed copies of a statementissued by the PMOI/MEK Social Department inside Iran for more protests across the country marking the annual Fire Festival. Iran, January. 11, 2019 – On Thursday, the workers of Haft Tappeh sugar mill, located in Khuzestan province’s Shush city, went on strike and demonstrated in front of the offices of the managers of the company. The workers held a gathering at the location of the factory and declared they would not be working because the company has not paid their salaries. The workers had said that if their demands are not met, they will go on strike and return to the streets of Shush for demonstrations. Come Thursday, they began their strike as promised. It’s worth mentioning that the Iranian regime’s prosecutor’s office had previously declared that the workers’ paychecks for the month of November would be paid on Tuesday, January 8. But the prosecutor’s office later revoked its declaration and said there would be no payment before the sugarcane harvest enters the company’s stores. The strike is taking place following a declaration made by a group of workers of Haft Tapeh. The organizers had called on their co-workers to protest in their workplaces and to go on strike if they don’t get their two-month-overdue paychecks. Haft Tappeh is Iran’s largest sugarcane factory and employs thousands of workers in Khuzestan. Jan.10-#Iran,#Shush: #Workers of the #HaftTappeh Sugar Mill protesting their unpaid wages despite promises given by the authorities. The workers of Haft Tappeh went on a month-long strike in November, demanding the payment of their overdue salaries and the removal of the company’s private owners, whose mismanagement and corrupt policies have caused the deterioration of work conditions for the factory’s workers. During their protests, the workers of Haft Tappeh earned the support and respect of many communities and various segments of the Iranian society. The strike of Haft Tapeh also became strongly tied to the protests by the steel workers of Ahvaz, who had been striking for similar reasons. Fearing the strike would trigger protests in other parts of the country, the Iranian regime cracked down on the protesters, arresting several of the workers and taking them to prison. Esmail Bakhshi, one of the representatives of the workers who was arrested and imprisoned by the Iranian regime’s security forces, recently published a detailed account of the tortures he was subjected to during his incarceration. The Iranian regime has resorted to similar measures against the steel workers of Ahvaz. But without responding to the fundamental and basic needs of the workers, the regime has only managed to buy a limited amount of time for itself. As the resurgence of the protests of Haft Tapeh sugarcane workers shows, it is only a matter of time before the flame of protests will rise from under the ashes of repression. Iran, Dec. 3, 2018 – As the regime ruling Iran faces increasing regional and global isolation, protests and strikes are escalating across the country, causing an even more concerning crisis for the mullahs’ regime. A group of retired teachers from across Iran rallied in the capital, Tehran, on Sunday, protesting not receiving answers to their demands. Their gathering was held outside Rouhani’s office. Minibus drivers were rallying outside Tehran’s City Council building, protesting unjust fines imposed on their line of work. A group of drivers of the Greater Tehran Bus Drivers Syndicate, and members of the Sepidar 2 and 3 housing projects, rallied outside the company office building demanding their houses after placing down payments. In Hamedan, western Iran, taxi drivers launched a strike on Sunday protesting heavy tolls imposed on their line of work. High school students in Najaf Abad, central Iran, rallied on Sunday protesting poor educational programs, the addition of irrelevant books and criteria. Their gathering was held outside the city’s Education Department. Employees of the Bandar Shapour municipality in southern Iran held a protest rally demanding their delayed paychecks. City rail workers of Ahvaz rallied for the second day on Sunday, protesting the fact that their paychecks have been delayed for 18 months. The workers were seen spreading symbolic table sheets on the ground to indicate they have nothing to eat. Sources from across Iran are continuing to report numerous protests and strikes by people from all walks of life. In Karaj, west of Tehran, personnel of the local Khomeini Hospital held a rally once again on Thursday, demanding their delayed pay checks. In Sabzevar, northeast Iran, a group of Hakim Sabzevari University students held a gathering protesting intensive security atmosphere and crackdown measures on campus. The students are saying one of the university’s deputy deans is constantly opening more cases against student activists. In Babol, northern Iran, clients of a regime-linked credit firm rallied on this day, demanding their stolen money returned. This gathering was held outside the city’s mayor office. In Khorramabad, western Iran, municipality workers of the city’s third district held a protest rally demanding their pay checks that have been delayed for the past few months. The main opposition to the Iranian regime, the People’s Mojahedin Organization of Iran (PMOI / MEK) and other associated groups are expanding their activities across Iran. Their calls for regime change are getting louder and louder despite the grave danger that they are putting themselves into. Dissidents and political opponents in Iran face the harshest of punishments. Not only do they risk arrest, torture, imprisonment and even execution, but the lives of their families are also at risk. The regime has long considered being a member or supporter of the PMOI / MEK as being worthy of the death penalty. In the past, even people with loose affiliations to the PMOI / MEK have been executed. In the following video, members of Resistance units in Tehran can be seen putting up posters in support of the opposition. The posters include the photo of Massoud Rajavi – the leader of the Iranian Resistance. They pledge to continue fighting against the clerical regime and declare that they are going to respond to fire with fire. 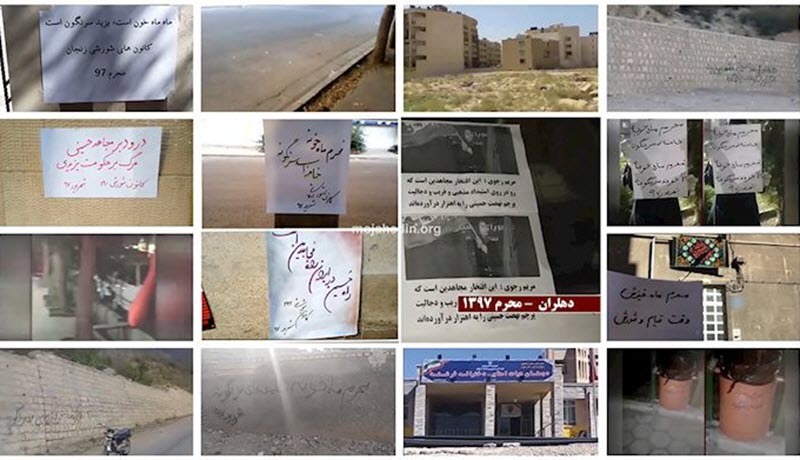 In the north-western part of the country, specifically in Zanjan, members of local resistance units also put up posters in which they promise to continue battling against the regime until it is finally overthrown. They too pledged to continue playing a role in the struggle. In the following video, we can see posters in favour of the PMOI / MEK sitting on the windscreen of a number of cars in Iran’s capital city, Tehran. Many of the posters included messages saying that the Supreme Leader of Iran – Ayatollah Ali Khamenei – will one day be overthrown. In Qazvin, in the north-western part of the country, more members of the Resistance movement have pointed out that the mullahs’ regime is using religion to preserve itself so that it can stay in power for longer. In Tehran, members of a group called the Resistance Unit 777 were seen standing in a crowd proclaiming to continue the fight for freedom against the clerical regime. Another tactic that has been used in the country is to put graffiti in the cities to spread the message of solidarity between members of the Resistance. In this video, members of certain Resistance units wrote slogans in graffiti across the city of Shiraz in the south-central part of the country. The Resistance is tirelessly and selflessly working towards the greater good of freedom, democracy, equality and human rights for the people of Iran. The personal cost of their involvement is unimaginable to most people who have not lived under clerical rule. Many members of the Resistance have personally experienced the violent oppression of the mullahs’ regime. Others have had family members or friends that have been killed or imprisoned in Iran. Others quite simply want to see an end to the clerical rule that is destroying the great country of Iran. The people’s desire for change is great and if regime change could come from the will of the people alone, the regime would have toppled years ago.